WELCOME to the fifty-ninth issue of the Bay City Post! - Keeping you updated on the best city on the grid! August will bring with it Hot Bay City Nights, with car washes to benefit Child's Play charity, and the annual crowning of Miss Bay City! To keep updated on those exciting events, as well as Bay City's weekly rumble, monthly Espresso Night (see below), and occasional block parties, please feel free to join the Bay City Alliance group. Regular and varied community events are part of what makes Bay City unique, and if you are thinking of moving to our fair city, attending these events is a great way to get to know the people who already call Bay City home. Two evenings ago, I attended Espresso Night at The Pen, a monthly event during which Bay City residents (or anyone from across the Grid!) are invited to gather together in a virtual coffeehouse to exchange stories, poems, ideas, joys and sorrows, or expound upon any topic imaginable - while remembering that The Pen is in a G-rated region, and that mimes, while occasionally entertaining, are expressly forbidden. It occurred to me during the evening what an unusual and wonderful thing we have in Espresso Night, and in the Bay City community in general. There are certainly private sims where communities exist, and where people gather to chat or have events. The difference is, those sims are generally started by a group of friends, so the communities which occur within them are already formed. Bay City is on the Mainland, and is comprised of 46 (!) sims. Certainly those of us who live or work there are not going to know all of our neighbors, and not all of us are going to get along all of the time. And yet, a strong-knit community does indeed exist - of people who play together, work together on projects, and work out our occasional differences in a democratic way (such as throwing people in the canals or burning down the city on a regular basis). Seriously though, the community that exists here is something rare and unique, and I feel privileged to be a part of it. 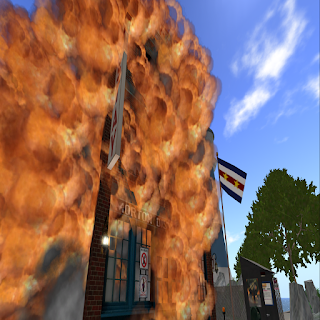 "In my early Second Life as a Linden, Robin Linden was a tremendously positive influence on me, and she gave me a book called The Great Good Place by Ray Oldenburg. It's about the importance of social surroundings like coffeeshops in creating community. (Context: https://en.wikipedia.org/wiki/Third_place) To this day, I think one of the best examples of SL heritage is the monthly event hosted by Marianne McCann that breathes life into this beatnik building, which I've had the joy of attending on several occasions with friends. You mentioned Espresso Yourself in a previous post, and I recommend that any new Resident of Second Life should explore the broader Bay City — including the museum! — to get a feel for an abundant culture that continues to thrive over the years." Echoing Torley's sentiments, if you are reading this paper, you are at least somewhat interested in Bay City and what happens here. I'd urge you to get more involved - attend some events or throw an event, get to know your neighbors, and stop by the Community Center for information and freebies, or to attend a weekly Bay City Alliance meeting. What makes this city fabulous is the people who live and work here, and all of the combined interests and efforts of those people. What will YOUR contribution be? Oops, looks like someone left the coffee pot on at the Y-Stay again!